FULL TIMEThe final siren sounds and it's a boilover at Etihad Stadium. 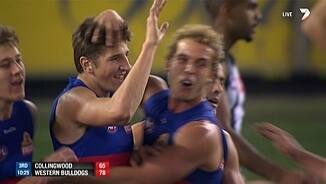 The Western Bulldogs have held on to record a memorable 8 point win. BEHIND BULLDOGSCrameri runs inside 50 but cannot seal the deal. Time looks to have run out anyway. Bulldogs putting numbers around the ball with Giansiracusa their only spare. GOAL BULLDOGSThe upset is well and truly on here at Etihad Stadium. Bontempelli kicks to Tutt who marks deep in the pocket. His set shot is a beauty and a match winner! Less than two minutes remains with the Bulldogs leading by one point. Tense is an understatement. GOAL MAGPIESSeedsman bursts through once again and he kicks it to Cloke who marks. He is a giant of a man and this is a giant moment. CLOKE KICKS IT! Bulldogs by one point! GOAL MAGPIESWhat seemed to be an infringement in the marking contest is all forgotten as Pendlebury takes possession. He dodges and weaves and the path opens. He kicks the goal! The clock ticks down to under five minutes and the Magpies need 3 goals to win. BEHIND MAGPIESWhite kicks long from outside 50 where Blair attempts to take the mark, but he can't come down with it and a behind results. The momentum is beginning to shift in the Collingwood direction as the crowd begin to get behind them. GOAL MAGPIESCloke has the numbers stacked against him but still beats four Bulldogs opponents to take the mark. He goes back and kicks the goal to give them a lifeline. Collingwood really need to lift their game with the clock ticking under 8 minutes. Dwyer takes a good saving defensive mark for the Magpies who really need to get the ball moving in their forward direction. The upset is on at Etihad Stadium with the Bulldogs leading by 20 points. Collingwood need the next goal and pronto. BEHIND BULLDOGSSome great work by Grant to chip it to Jones 20 metres out. Jones' shot at goal is very disappointing. Bulldogs InterchangeRyan Griffen off due to an injury. Magpies InterchangeJack Frost off due to an injury. Bulldogs InterchangeAdam Cooney off due to an injury. Welcome to Etihad Stadium for the Collingwood v Western Bulldogs Round 13 clash. 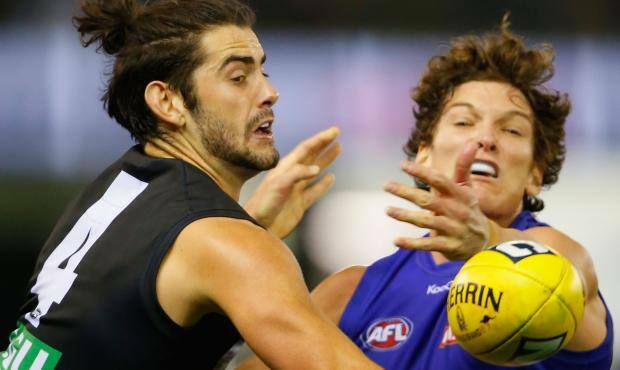 THE UNDER-fire Western Bulldogs have hit back at their critics with a stunning eight-point upset of Collingwood at Etihad Stadium on Sunday. The Dogs led narrowly at every change and held off the fast-finishing Pies in a courageous 16.10 (106) to 15.8 (98) triumph. The win followed a disappointing loss to the Brisbane Lions at the same venue last weekend and inflicted a savage blow to the Magpies' top-four hopes in front of 28,339 fans. Four goals from much-maligned key forward Liam Jones inspired the victory, his side's first over the Pies in eight meetings. Travis Cloke slotted six goals for the Pies – two in the heart-stopping final term - and livewire small forward Jamie Elliott added four, but it wasn't enough to prevent Collingwood slipping to 8-4. It was only the Bulldogs' second win in the past eight games – the other coming against Melbourne – and relieves some of the pressure on Brendan McCartney's men from their increasingly impatient fans. "We hung on today, we beat a really good opposition. We dealt with the game OK, we had an eight-day break, they had a six, and that might have told in the end," McCartney said post-match. "It was a good result for our players and our club." After a see-sawing opening half, the Dogs took a one-point lead into the long break and were never headed. 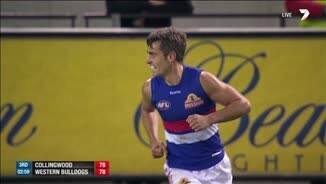 The Dogs opened a game-high 20-point lead in the final term after Jarrad Grant kicked truly and Liam Jones missed a set shot at the nine-minute mark. But then Collingwood surged. Cloke booted two goals and Scott Pendlebury chimed in with one, but a brilliant set shot from near the boundary by Jason Tutt after 25 minutes sealed a famous win. The Dogs’ old heads and young guns combined brilliantly. Dogs skipper Ryan Griffen was outstanding with two goals and 27 possessions and had the better of tagger Brent Maccaffer. Midfield star Tom Liberatore (34 disposals), Luke Dahlhaus (29), Jack Macrae (28), Daniel Giansiracusa (22) and ruckman Will Minson (13 and 44 hit-outs) also led the charge. Pendlebury was typically sublime all match but couldn't will his side to victory despite gathering 30 touches, while he had good support from Taylor Adams (30) and Sam Dwyer (28). Momentum swung violently throughout the entertaining clash. 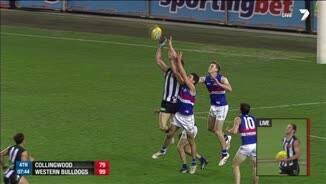 Collingwood threatened to break the game after booting the opening three majors but the Bulldogs answered with four goals to lead by six points at the first change. The lead changed hands four times during the see-sawing second term, but the Dogs showed the resolve that has been missing at times this season. 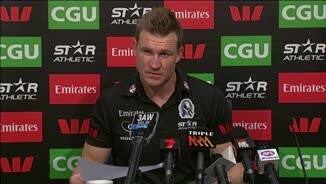 "You've got to give them credit, around the ball in particular," Collingwood coach Nathan Buckley said. 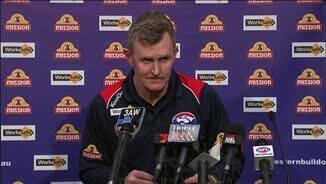 "They nutted us in contested ball (167-159) and clearances (51-34), which is where it starts…And we've allowed 57 inside 50s, which has been a bit of a trend over the last four or five weeks. "And we had a young backline and they weren't able to stand up as they have for so much of the year to date." The win lifted the Dogs one spot on the ladder to 13th at 4-8, but was soured by a hamstring injury to Brownlow medallist Adam Cooney in the first quarter. McCartney said Cooney was likely to be sidelined for several weeks. Meanwhile, Collingwood defender Marley Williams is facing a nervous wait after he was reported for striking Nathan Hrovat on the stroke of quarter-time as a melee erupted on the half-back flank. 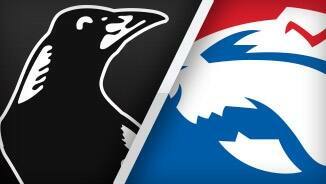 Collingwood: Broomhead replaced Grundy in the third quarter. 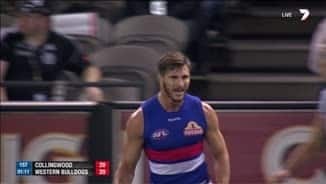 Western Bulldogs: Giansiracusa replaced Cooney in the first quarter. Reports: Marley Williams (Collingwood) reported for striking in the first quarter. Official crowd: 28,339 at Etihad Stadium.